My Two Portrait Paintings on National News. You will see in the middle of this video of two super large portrait paintings I did of the founders of the famous Original Hotdog Shop in Oakland (Pittsburgh), Pennsylvania appears on ABC7news video. It is a good exposure to have and creates more clients even in a short viewing. Click on More Information button to see the video. 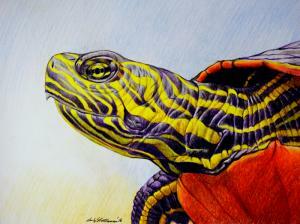 Here you will see my new color pencil drawing video demonstration of the Western Painted Turtle, copy and paste this https://youtu.be/yrHv7VoOEI8 or "Click Here for More Information," below to see the video, thank you.